Through photographs, a wall drawing, neon texts, and an architectural model, the exhibition entitled Shanty , focused on meetings of sea and land. Exposed coasts were presented as spaces of peril for those at sea, inlets as places of shelter, estuaries and canals as places of trade where the sea enters the land, and the seashore as a site for DIY vernacular architecture where a vessel becomes a houseboat, permanently positioned in the tidal zone. Shanty included works that refer to distant shores and others that made specific reference to Portsmouth. Joanne Bushnell, Director of aspex, talked to Roger Palmer soon after the opening of Shanty. Joanne Bushnell: Roger, you were born and brought up in Portsmouth. Two pieces in the show have been made in response to a houseboat moored locally. Can you talk about this work and what it was about the structure and its context that interested you? Roger Palmer: One particular work is also titled Shanty; it's a monochrome grey, 1:20 scale model of a houseboat located close to the entrance to Langstone Harbour at the eastern tip of Portsea Island. I asked an architectural model-maker to construct a detailed representation of this vessel that sits in the tidal zone, one of several such houseboats in that part of the city. What interests me about these hybrid constructions is that, as they seem to be exempt from planning or building regulations, they look like local examples of informal housing, reminiscent of the DIY architecture of shantytowns that have grown up in various coastal cities throughout the world as a result of migration. This particular 'shanty' is half-boat, half-house. The lower section may be recognisable as the hull of a World War II military landing craft and the top half looks somewhat like a garden shed. The structure, named 'Sea Folk', is positioned horizontally as if sea worthy, but it sits on supports made of wood, concrete, stones and chains. For the past thirty years, 'Sea Folk' has been the property of a local woman, currently aged 94, and her family. On fair-weather days she travels from her home in Portsmouth to spend time on her houseboat. During the preparations for the exhibition, I became a close friend of the family who were generous and enthusiastic collaborators at every stage of the project. In the second work, titled Houseboat, two colour photographs made in roughly the same position but on different days, present 'Sea Folk' at high and low tide. The images are shown on an LCD screen so that they slowly fade, one into the other, low tide to high tide, back to low tide and so on. The relationship between these two small works, and their different modes of representation of a local houseboat was a primary focus of my preparations for the exhibition. The focus on a local craft, its location in a city with a long and specifically military maritime history and my own connections to Portsmouth, have all contributed to the exhibition. I wanted to contrast the potential irony of a precise architectural model of a dilapidated, hybrid structure, with still photographs that are in constant movement relative to each other. So on one level, these two works focus on a particular houseboat, but I hope that they also have the potential to make wider references. JB: On entering the gallery, the first work that visitors will see is Shanty, a pair of neon texts. Why a circle? RP: As you know, I had the wall facing the entrance to the gallery specially constructed for the two arcs of neon text that trace sections of a 3metre diameter circle. If we think of the circle as a clock face, we might say that the shorter, turquoise text is positioned between 9 and 11 o'clock while the other, light blue, text lies between 2 and 6 o'clock. When the turquoise neon is illuminated the blue text is switched off and vice versa. So the work functions like a lighthouse or perhaps a warning beacon of oscillating turquoise and blue lights. The neon on the upper left of the circle reads 'Pier and Ocean' and refers to a group of works made by Piet Mondrian in 1914/1915. This set of drawings and a single painting are said to be the product of Mondrian's observations the sea's movement while walking on a starlit night beside the North Sea. In the Pier and Ocean series Mondrian drew oval shaped clusters of horizontal and vertical marks. A preponderance of vertical lines in the lower centre of each drawing suggests the presence of a pier protruding into the water. The text on the bottom right edge of P & O reads 'Peninsular and Oriental'. The Peninsular and Oriental Steam Navigation Company is now better known simply as P & O Lines, a UK-based ferry, cruise and freight company. The word, Peninsular, refers to the Iberian Peninsula, the first destination for P & O ships, after which services were extended through the Mediterranean to India, Hong Kong and eventually to Australia. P & O therefore references both a 19th/20th Century colonial shipping company and Mondrian's early 20 th Century approaches to abstraction through his observations of the sea at night. As the illuminated texts trace sections of a circle, P & O might also suggest references to the earth or the moon; it could be a new moon in the arc of 'Pier and Ocean' or an old moon in 'Peninsular and Oriental', and so return us to tidal movements. 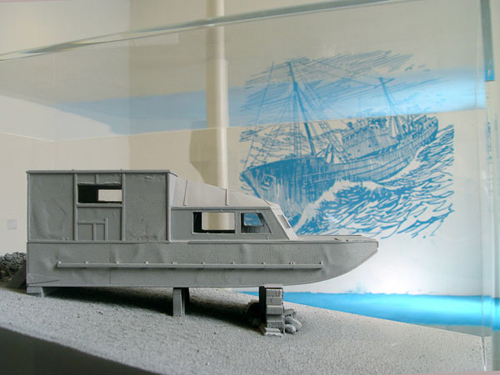 JB: Roger, this wall drawing, A Trawler in Rough Sea , is really striking for visitors entering the gallery space. Can you tell me something about this work, its form and its references? RP: This is a re-presentation of an image that I found in Looking at Scotland , a school textbook from the 1960s. In a section on the Scottish fishing industry I came across a small illustration that I liked for the energy and the graphic economy of this drawing. So I decided to reproduce the drawing using a technique that would in some way add to the sense of energy and violence of the original image. I enlarged the image to approximately 300cm wide using a vinyl stencil that I attached to the wall. Once the remainder of the wall had been masked out and the gallery sealed, I began to throw the contents of a 10kg tub of sky blue powder paint at the stencil. Most of the powder settled on the floor and surrounding surfaces, but the more pigment I threw, the more particles of powder clung to areas of the white wall exposed by the stencil. So this fragile work is the product of a violent activity. After removing the stencil, a delicate process that led to yet more of the powder falling to the floor, two completely different but interrelated areas of pigment were revealed: a fragile image on a white wall and an expanse of blue powder on a grey concrete floor. The powder is deepest immediately beneath the image where evidence of footprints and stepladders can still be made out. I hope that some visitors will see a connection between the dusty blue pigment and the coloured neon light that bleeds from P & O. It is remarkable that here we are on the first morning of the exhibition and already some rather small feet have been unable to resist running into this sea of blue pigment at one end of the gallery! JB: Roger, you have produced a huge body of photographic work, and I know it was very difficult to select just five images to show within this exhibition. Can you tell us about how you selected them and how they relate to the other works we've discussed? RP: Yes I do have a huge archive of photographic images, but I exhibit very few photographs relative to the number of exposures I make. Making photographs is for me a lengthy process, in that I go somewhere, for a few days or a few weeks and, in a fairly unstructured way, collect perhaps several hundred images to eventually arrive at very few works, in some cases several years after first making a negative. I sometimes joke that every time I print a new picture I like I throw two away, so there always seems to be less than when I began! The five black and white photographs in Shanty were made in five different countries over a five-year period - Australia, Egypt, Jamaica, Malaysia and the United States - and they all feature different meetings of land and sea. The picture that we're standing beside was made in 2006 at a place called Plum Point. So if any visitors to the exhibition happen to know the location of Plum Point they will be able to identify the place in which I made the photograph! I don't wish to be anymore specific about this or other source locations because making a photograph in a particular place is just one part of a lengthy process that culminates in the display of framed prints in another place. What is important is that the five pictures are here together now as components of an exhibition in a maritime city: an exhibition that also includes works in other media. Their different places of origination are therefore not so important, hence my preference for local, often anonymous, place-name titles. Plum Point was a key photograph in determining the way that the exhibition might function. By placing this relatively small photograph of a shipwreck at the opposite end of the gallery from a large wall-drawing, I tried to suggest a relationship between two images of similar vessels, presented in two different media, one of which is monochrome grey, the other, monochrome blue; one ship is visibly being tossed by the waves and the other has been wrecked on a windswept shore. The other exhibited photographs, Port Victoria, Kuala Besar, El-Cap , also feature relationships between sea and land with a different type of sea-going vessel visible in each image. Here a picture titled Algiers presents a combination of half visible, half hidden, or implied elements photographed in bright sunlight. One can see part of a vessel including its name, 'Carnival Conquest'. It has the appearance of a modern cruise ship and is moored at a quayside on the far side of a broad river. In front, and partially concealing the vessel is a clump of trees. Some driftwood has accumulated at the foot of the trees. A dark shadow falls across the grass in the foreground and on the trees. It may be possible to trace another part of that shadow on the water on the left side of the picture: perhaps it might be identified as the shadow of a bridge? So here is a series of partially represented elements that collectively comprise the photographic picture plane. The title, Algiers, might initially suggest that the picture was made in a port city in North Africa. But the evidence of the place in which the image was made doesn't appear to support this. I enjoy such questions of location/dislocation and don't wish to be more precise other that saying it was made in a place called Algiers. Through representations/misrepresentations of spaces and places, the black and white photographs in Shanty address questions of photographic representation as well as how ideas generated through photography might inform works in other media and vice versa. So I hope that these five pictures can encourage visitors to negotiate an oscillating pair of neon texts, a powdery wall and floor drawing, a pair of dissolving colour photographs, an architectural model and the distinctive features of a recently converted gallery that recall the naval history of the Vulcan Building. And, as they leave aspex, I hope that Shanty might continue to resonate in the heritage-laden, commercially revamped, maritime city of Port's Mouth.